WHY?????? – When your “young” child constantly asks “WHY”, he/she is not trying to be obnoxious, annoying, or disrespectful; they are truly “Seeking to Understand”. Last night I babysat my 4 year old grandson and between 4:00 & 7:00 he asked me “WHY” 44 times (I counted). 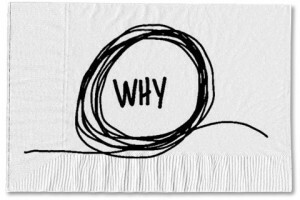 Because I know better, I attempted to give an appropriate explanation to every “why” question. He finally said “Oh.” Why don’t I have hard liquor in this house – SMH.